Situated in a group of Disused Ex Naval Hangers on the edge of Lee on Solent airfield at the former HMS Daedalus, is a classic example of British heritage that deserves more recognition than it currently gets. 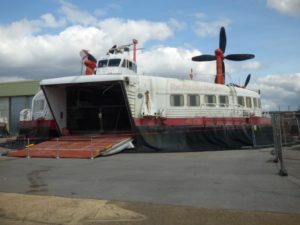 The British Hovercraft Museum is a shining example of British engineering skills spanning the last 50 years that deserves a lottery grant to protect the 60 odd examples of this iconic craft it manages and yet suffers from a lack of security from only having three year leases on the site that negates the ability to get sufficient funding to progress to the next level. Manned by a small yet enthusiastic bunch of enthusiasts, a day visiting this location will leave you with the fullest appreciation of this great innovative classic design and realising why such craft need a permanent secure location where the pioneering skills of the designers can be passed forward for future generations to enjoy. 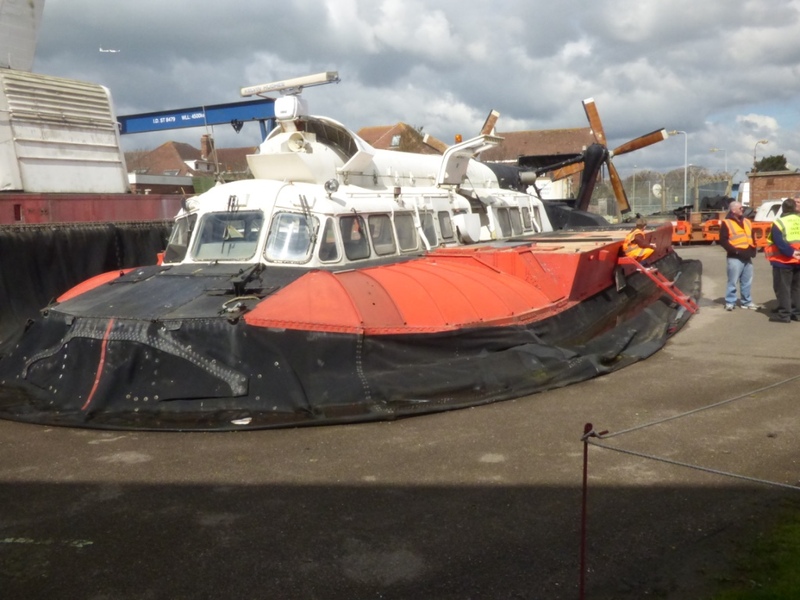 Currently enjoying greater publicity through a campaign to restore The Princess Margaret class of SRN4 Hovercraft once used to convey both cars and passengers across the English Channel, the Museum now opens regularly on Saturdays throughout the summer months from 10am until 4pm. As you roam through the open hangers, a skilled team restores examples of these craft to running condition and are generous with their time, keen to inform and pass on their knowledge of the unique go anywhere craft that are actually still in production today by Griffin at Southampton. As I wandered around this unique environment where everyone was welcoming I came across curator Alan Burns an ex SRN 4 pilot with Hoverspeed. 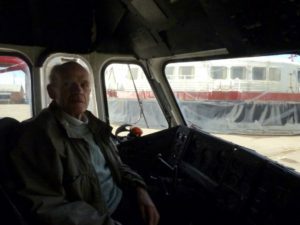 As the only qualified pilot associated with the museum, Alan’s passion still runs clearly deeply. Offering to show me the dynamics of the cockpit of an SRN4, Alan exudes a passion for these great sleeping beauties and is happy to pass on his delightful experiences and to show me the archives that aren’t even open to the public where there are vast amounts of both cine film and original drawings. When you hear the great man speak about flying a craft at up to 75 knots across the channel with upwards of 100 cars and 400 passengers on-board, you realise the rare skillsets that the man processes. Punctuating the anecdotes with witty jokes, such as how pilots never drank in pubs called “The Plough Inn “, because it relates to a manoeuvre where the nose of the craft digs into the waves and instantly stops in an abrupt manner best avoided, you realise that the man still lives his previous vocation. This is a family affair with his lovely wife running the museum shop and serving teas and coffees. Hovercraft used to be legislated by the CAA but have now transferred to Marine Craft Authority rulings and whilst you stroll around this facility you capture unique examples of craft ranging from personal transport for the Sultan of Brunei through to the craft used in a Pierce Brosnam Bond movie. Examples on display include military examples that have flown to the North Pole to prototypes of proof of concept craft where skills are evolved for future designs. Static displays include plenty of detail of propeller designs including a giant 21-foot example, and an example of a Rolls Royce Gnome engine utilised in the SRN5 (and used in Whirlwind Helicopters). One preconception I had that was wrong was that all hovercraft utilised twin engines for both lift and propulsion and ran on jetA1 fuel. This is in fact incorrect. Some ran on diesel and there are examples of current designs being manufactured here that utilise Vauxhall Vectra car engines with air ducted off to fill the skirts from the main fans. 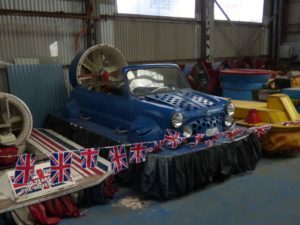 Now that’s what I call a Mini Hovercraft. pressure and as you increase the size of the cushioned area so the effective pressure required to lift the mass decreases. Skirt material is also quite thin and arranged in pockets that when damaged don’t interfere with operational abilities of the craft as the adjacent pockets fill the deflated void. With relatively small runs of build programs over the years, these craft reflect traditional ways of manufacturing and are delightfully carbon fibre free, but did need constant attention to prevent the scourge of corrosion taking hold. Having tried one of these unique craft myself and ticketing information available from the kiosk about Isle of Wight services, I would say its one of those experiences you should all try once, even if they are tremendously noisy. Not one but two examples of the big beast survive. This is one of those delightful places where you get to walk through the aircraft and sit at the controls of these intoxicating machines imagining the glamour of high speed travel as you waft across the sea towards the continent. 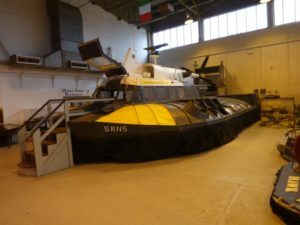 Not wishing to spoil your enjoyment of a thoroughly great day out at very reasonable pricing (£7 for an adult), all I would say is you wont be disappointed should you choose to visit Lee on Solent British Hovercraft Museum. For your GPS Just pop in the postcode PO13 9NY. 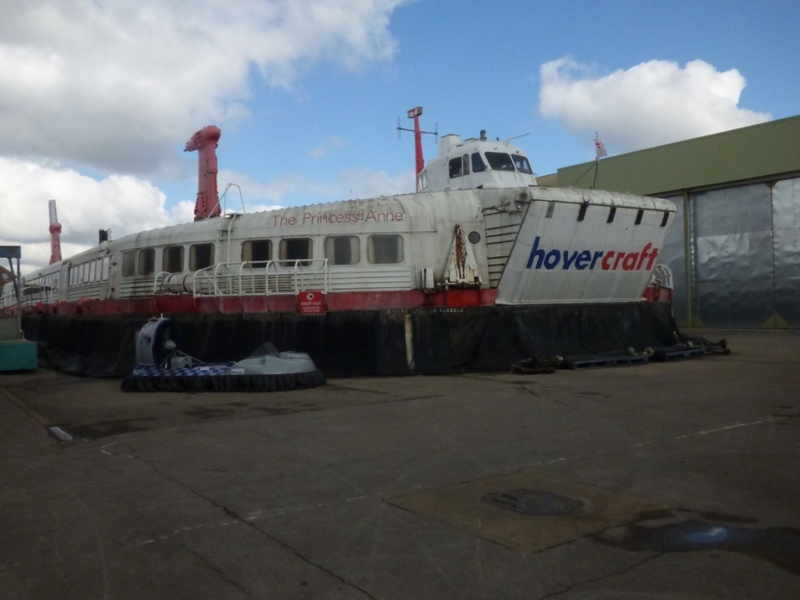 More information at www.hovercraft-museum.org. I will return for another visit sometime soon.